I especially enjoyed going up to Scotland, one of the few spots in Europe where built-up areas could be left behind, lovely country for “nap of the earth” flying. And it was sort of fun to see whether I could make this clumsy, giant airplane do decent eight-point rolls. My predecessor as wing commander had averaged one sortie a month, always with an instructor in the right seat. 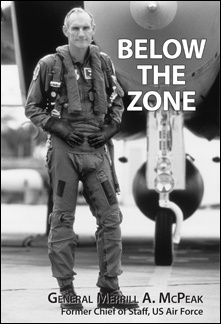 He was a fine officer, but the core mission of the organization was to fly and fight, and his approach sent a certain signal about leadership to the crew force. Leadership has to do with people and, in particular, getting them to perform. It is the supremely active role, about building a team, calling signals, achieving a result—with outputs. Management, on the other hand, has to do with things—budget, real property, equipment, inventory. (Where it concerns people, it is a question of human resources or head count.) Management is a much-maligned undertaking, seeming so passive, so aimed at regulating inputs. Thus, leadership reigns supreme over management in all walks of life, but the eclipse is most total in the profession of arms, where activity, even the image of activity, carries outsized importance. Napoleon is supposed to have indicted the British as a “nation of shopkeepers,” unfit to join him in battle, and in military life there is still something a little suspect about number crunching, keeping the in-basket empty, starting meetings on time. In small units, it’s certainly leadership that’s wanted. As Sherman is supposed to have said, the captain is the company. At the lower levels of an organization, problems may be complicated, but solutions are usually simple, handled in person and on the spot. But as the size of the outfit grows, the 100 percent leadership model falls apart. In large organizations, slapdash administration will fatally undercut even the strongest leadership. Those annoying inputs had better be managed. That said, appearances matter, so senior officers are well advised to do their management chores out of sight, even after normal duty hours. In daylight, attend to leadership—leadership by walking around and pushing doors open, leadership by looking and seeing, leadership by hands-on performance of the unit’s mission, and especially leadership by teaching. Counting preparation, I spent perhaps a third of my time explaining to groups of people what we were trying to do and convincing them it was important. Leadership involves establishing a shared commitment to the organization’s goals. Sitting in the office will not get this done. Still, no real tension exists between leadership and management. They are not binary alternatives, but two aspects of the same job. A commander must sit in the office. Just be sure to do it at night. I scheduled myself to fly once a week, and always with a navigator, preferably the most inexperienced or junior available.